The story takes place in a small Sumatran village called Taratakbuluh, where the Japanese have established a prisoner-of-war camp for Dutch internees. Although there is some of the violence that we have come to expect when reading about Japanese POW camps, Lieutenant Osé runs the camp without excessive brutality, so much so that Sergeant Kiguchi – who suspects looming trouble – feels frustrated that he’s not allowed to use his usual strategies to get information. Marahimin alludes to this with restraint, as he does in other instances of violence. In the past his swiftness of manner had caused the death of six or seven detainees. A fair number of Dutch internees, forced labourers and civilians as well had suffered broken bones or other physical damage at his hands. His style had done little to raise him in rank but he didn’t mind. An enemy was an enemy and should be treated as such, even if he had surrendered. If the enemy won, Kiguchi would be treated in the same manner. As for the romusha, well, they were a colonised class of people, little better than slaves. (Chapter 1). The romusha were Indonesians forced to work for the Japanese, as distinct from those left to continue their traditional way of life as best they could under the Occupation. The romusha were despised as collaborators by their own people and as unpaid labour by the Japanese. Kliwon is a sort of gopher with considerable freedom of movement but he has been displaced from his own people and no one trusts him, while Satiyah has been assigned to Lieutenant Osé as a house servant and ‘comfort woman’. She was widowed by the Japanese treatment of her schoolteacher husband but paradoxically she marvels that under the Japanese regime, she is now treated by Osé with more respect than she ever was under the Dutch – because Osé wants her only to perform the tea ceremony and not for anything else. Her previous master, Osé’s friend, had raped her. The story begins just as the war is drawing to a close. The bombing of Japanese cities has reached Tokyo, Hiroshima and Nagasaki have been destroyed, and even tucked away in this remote outpost in the jungle, the Japanese are aware that the war is almost certainly lost. Lieutenant Osé idles away while he waits for orders, musing over his wife’s enthusiasm for him to join up and her eventual desertion. He wonders about the safety of his children, who are now in the care of his parents, where the bombing is. Eventually he is called to a briefing, but the orders are so vague he still doesn’t know what to do. So there is uncertainty in the camp and some of the detainees take the opportunity to plan an escape. This causes dissension because those who don’t wish to join the escape attempt know that Kiguchi will enjoy the opportunity to inflict brutal punishment. The story centres around the state of flux which impacts on all these relationships as the war ends. What was most interesting for me as an Australian reader was the way the author explored the impact of war in remote areas. In some ways, the war is far away and seems to have little effect on everyday life, and yet in other ways, the presence of the POW camp and the movement of peoples disrupts long-standing traditions and relationships in ways that can never be restored. Publisher: Book Cyclone, an imprint of Typhoon Media, from the print edition published by the Lontar Foundation. Let’s hope that the Frankfurt Book Fair shines a spotlight on Indonesian writing and that the momentum lasts. 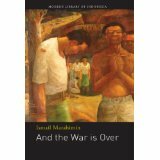 I’d like to see Australian publishers take up more Indonesian titles, and from other parts of SE Asia too. But there has to be a market for it. Interest in Chinese writing is increasing, so maybe there will be a spin-off from that.